The beginning of the new term ushers in a new focus in Humanities. Starting this week we begin the study of stories in Canadian history. Stories provide a vital opportunity to bring history to life. Through stories, people share information, values and attitudes about history, culture and heritage. It is through these stories, that history is preserved and passed onto future generations. What do our stories tell us about what it means to be Canadian? What are the stories of the people and groups who immigrated to Canada? What is your personal story of immigration? These are some of the questions we will be looking into as our focus in Humanities shifts, and looks into the study of history and stories. We will explore how these stories and history shape the Canadian Identity. 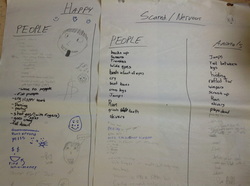 The first activity will focus on each student’s personal story of coming to Canada. Their family may have been in Canada for as long as anyone knows or the story of coming to Canada may be more recent. We believe each student has a story to tell. Students will work closely with their parents, as partners, to share stories of family history. We are asking each student to find a photo as a jumping off point for their story. The photo may show people, places or objects that are important to the family’s history. Precious family photos need not come to school, as students can take a picture of the photo they wish to use. We are excited to work with the students to preserve their story and share their history. Here is the link for the English Zone website that you can use at any time for extra online practice in numerous areas to improve and expand your knowledge and usage of the English language. Here is another site that you can use to expand your vocabulary. We are beginning the first of many projects that will take us across our great and vast country of Canada. You have had the opportunity to view a couple of videos that looked at the wonderful expanses and huge diversity of not only the land of our country, but its people. For our first project you will research and explore one of Canada's 44 National Parks. You will be creating a promotional brochure that emphasizes one of the outdoor activities that is available in that park, as well as write an exciting description of why you think people should visit this wonderful place! We are now gaining some momentum in our Writer’s Workshop. Students have been enthusiastic with their independent, free-writing. Now we are beginning to introduce some mini-lessons that have students thinking of various skills or tools that they can incorporate into their writing. The first topic that we have looked at is descriptive writing using “show rather than tell”. Student’s engaged in acting out various emotions including: anger, sadness, joy… and then recorded what those emotions looked like. So, instead of telling the reader, “Bobby was angry.” students are now developing thoughts such as, “With jaw clenched firmly, Bobby stormed into the room and threw his backpack upon the floor.” To practice this skill, we will have students changing skeleton sentences into descriptive sentences with elaborative details. We will also have students brainstorming to come up with effective adjectives, adverbs and strong verbs to emphasize various emotions. We have begun looking at the five factors involved in the study of geography: Location, Region, Movement, Place, and Human Environmental Interaction. We focused on the concept of “place” with the settlement discussions and activities that students undertook prior to and during the Camp Sweet settlement project. 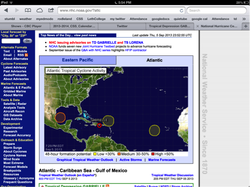 We delved further into the location factor by locating and following the current storms associated with this year’s Atlantic and Pacific hurricanes. The students had the opportunity to plot the changing coordinates of the many storms that existed in the oceans that further solidified their knowledge of absolute geographical coordinates using latitude and longitude. As a result, we may have even seen a passion for meteorology developing in some students. We will be winding up this unit with a review and quiz by the first part of the week of September23rd. 5.3 and 5.4 will have this unit test on September 19th. Camp Sweet was a hit this year, as we embarked on a new activity called "Settlers of Camp Sweet". Leading up to camp, we had discussions in the classroom about factors that influence the location of settlements. Things discussed include: Defensive factors, Route focus factors (where rivers and valleys meet), Natural Harbours, Bridging Points (narrow or shallow places where rivers are easily crossed), Location near natural resources, and areas protected from natural hazards (Eg. Floods, strong winds). We also looked at a video series entitled “We Built This City”. In three segments, an excellent overview was presented in regards to the triumphs and challenges faced by Paris, London and New York as they developed into the cities that they are today. Just prior to leaving for camp, students worked collaboratively in groups to choose an area (50mx50m) of Camp Sweet that they saw as desirable to develop a settlement with a population of 250 people in the year 1913. This was done by using Google Earth to view the property remotely. Upon arriving at camp, groups charged out on to the land to "stake their claims". Once at the site, students evaluated their surroundings and discussed how the land would help meet their needs. Busily, students then constructed five projects on their land that they saw as necessary to establish in their settlement prior to the arrival of the first winter. Some example projects that we saw included: Land cleared for cultivation, pens for livestock, trading post, mine, water tower, communal shelter, irrigation ditch, fort, lumber mill and other insightful ideas. It was very interesting to see how the students so readily and naturally fell into a trade network with neighbouring settlements. This was not initially an intended consequence that we foresaw. We knew that this was a successful activity when students asked us during free time to continue working on their settlements. On the final day of camp, students were then challenged with a sandbox activity. This required them to scale down their 50m x 50m to 1m x 1m. Students were very creative in their use of natural items to craft a miniature represention of their settlement.